So I’m clearly not trying very hard to not use Disney chracters… but I’m still getting my feet wet with this thing, and I find that excitement is the only thing that keeps me going when I’m making a collage. And if Beauty and the Beast was my favorite childhood movie, The Little Mermaid was a very close second. Let’s be real- Ariel likes to break the rules. She loves to have fun and she dances at every opportunity. She’s fearless when it comes to bright colors, and she’s of the opinion that a little sparkle never hurt anyone either. Pretty! Love these colors. I guess I might be an Ariel at heart! Also, someone tell my husband to get me that necklace. I’d get it for myself but somehow everything seems more fabulous when it’s a perfect gift! Ariel is my fave! Yay! 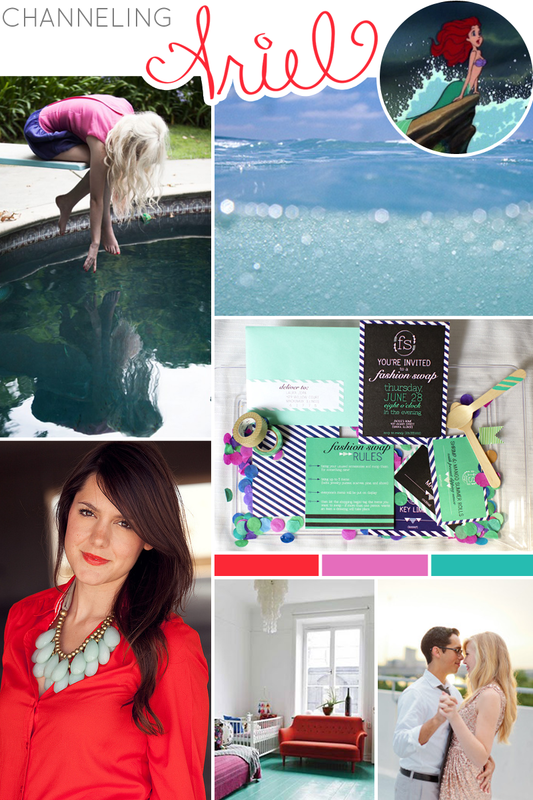 Loooove the colour palette you picked for this post! So pretty. The Little Mermaid was one of my favourites growing up – I had an Ariel backpack and it came with markers! SCORE. Loved that backpack.